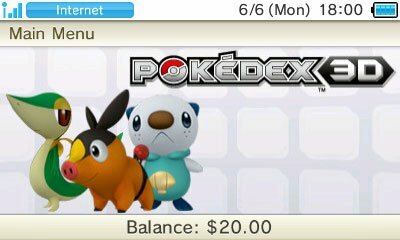 Pokédex 3D is a free download for the Nintendo eShop on the Nintendo 3DS. This game is more of a resource for players to utilise in order to aid in the training of Pokémon in Pokémon Black & White. The Pokédex 3D provides details on the Pokémon including stats, abilities, level up moves and more. In addition to the standard details, you can view the Pokémon in 3D with the Nintendo 3DS's abilities. Pokémon are gained via a variety of methods in this game. You can obtain them via QR codes, downloaded via SpotPass or by receiving them through friends. In addition to these standard features, the game also has Augmented Reality features allowing you to play with the Pokémon on your desk using the Nintendo 3DS's camera. This game encourages transfer between friends by having various Pokémon, forms and genders unobtainable in a single savefile, requiring you to transfer to get them all.